In the past year, the website Wonders in the Dark has conducted four genre countdowns. The first covered horror, and I responded to it by naming my #1 horror film as The Shining. Shortly thereafter, an animation countdown led me to write up my #1 animated film, the Quay Brothers' haunting Street of Crocodiles. In the next week or two, the site will wrap up its most ambitious and wide-ranging countdown, a musical list that featured a dozen or so contributors and spanned seventy entries. I myself submitted three selections: The Gay Divorcee, 42nd Street, and An American in Paris. As the countdown concludes, I will offer a review of my own #1 musical, though I'm keeping the title under wraps until this Thursday. But first, there's unfinished business. Lost in the shadows, appropriately enough, is a response to the site's third countdown - on that genre/style/movement, film noir. The noir countdown took place between February and May earlier this year, a time when I was all but absent (and eventually just plain absent) from the blogosphere. As such, I didn't get to read the pieces until recently, but they were worth the wait. Unlike the jovial, cheerful crowd that comprised the musical countdown, the noir beat was handled by just one person, Maurizio Roca, who wandered those cold dark streets alone, allowing one guest essay but policing the series parameters and placements with a strict understanding. Unlike the expansive horror, animation, and musical lists, the noir selection was as focused and intense as a harsh streetlight: early forties to late fifties only, two Brits allowed but otherwise American only, no Hitchcocks (he was practically his own genre), and please, black and white only need apply. Well, my selection also fits those restrictions, and it was on Maurizio's list too, at #18. It took a while, but noir (anti? )heroes are a patient, unrushed lot, waiting for the right moment to pounce and catch their prey. My prey is quite lovely, enigmatic, and perhaps a bit dangerous. Without further, ado, my #1 noir: Laura (1944). And yes, there are spoilers. Is it the portrait? 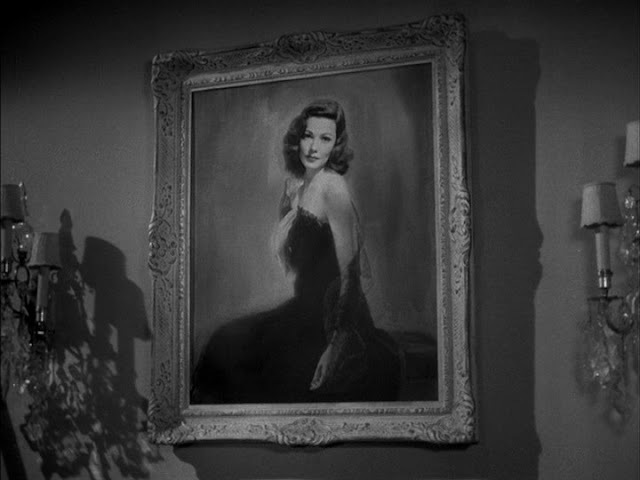 Waldo Lydecker (Clifton Webb) tells us the alluring painting doesn't quite capture Laura's essence. Maybe it's Waldo's loving descriptions - we see them played out in flashbacks, but for Detective McPherson (Dana Andrews), they must unreel in his mind like imaginary movies, half-glimpsed through a haze of perfume and cigarette smoke. An elusive image dazzling yet blinding, like the "silver sun" Waldo describes in his memorable opening monologue ("I shall never forget the weekend Laura died..."). Then again, perhaps it's something more intangible that makes McPherson fall in love with, not a corpse as Waldo cynically puts it, but Laura Hunt (Gene Tierney) herself - the girl before she was murdered. He's in love with something gone, something that once existed, that "essence" still lingering in the afternoon air but dissipating rapidly, a presence just missed by McPherson, in the room right before he entered but now vanished for good. Or has it? When I decided to play catch-up and name my #1 noir, I tossed around a few films in my head. The Third Man, which in all fairness probably should be called my favorite, I've decided to save for "The Big Ones," an informal series beginning next week in which I alphabetically review thirty iconic classics as yet unmentioned on The Dancing Image. I wanted something still infamous but not quite as transcendent here - something which said "genre icon" even more than it said "cinema icon." I've never really been a genre person and while I'd seen a number of notable noirs, there were quite a few I hadn't seen. While watching Maurizio's picks, I was able to catch up with many great films that had slipped through my grasp till now - and stuff like Murder My Sweet or Act of Violence or The Big Combo would have been worthy selections. Ultimately, however, I returned to a film I'd seen several years ago. In fact, I think it was the first one occurring to me when I mused over "#1 noirs," and as you can see here, it was ultimately the last too. In a way, Laura is a somewhat offbeat selection. Director Otto Preminger's classy touch brings forth cinematography and art direction a bit less hardboiled, more glossy and romantic than one might usually expect in a noir. And the story development is rather optimistic while the characters are not exactly noir archetypes, other than the detective. (As Maurizio says in his own review, "It didn't reside in the dark urban sprawl of Murder My Sweet or swim in the moral murk of Double Indemnity...[it] had the sophistication of uptown New York with a MGM kind of outlook for its characters.") While Laura may not be a "is it or isn't it?" test case, it's certainly not as pure a noir as many late forties crime films would be. Yet, in its essence, there's something about Laura that gets right to the heart of what I like about the noir world. There are many differing, sometimes bickering, definitions of what constitutes the soul of noir, ranging from the stylistic to the historic to the philosophical/political. I see the merit in most of them, yet what hooks me in to my favorites is ultimately the psychological element. The darkness of the mise en scene is an evocation of a deeper darkness, the twists and turns of a human mind burdened by self-consciousness, yet familiar enough with that curse to make a sort of nest out of it. These are characters who are comfortable being uncomfortable in their own skins. They have breaking points, and are often pushed right through them, but they're fighting existentially every step of the way against the cruel tricks of the gods, or more accurately, of their own demons. Laura is full of these complexities, with each character perceiving and defining the others in different and uncomplementary ways. To take just one example, look at Southern charmer and charlatan Shelby Carpenter (Vincent Price). To the weary, needy Ann Treadwell (Judith Anderson), Shelby is as coldly cynical as she is. To romantically-inclined Laura, he's like an immature child, selfish but fundamentally harmless; to MacPherson, he's a shifty, slimy sociopath; to Waldo, a sneering yet insipid brute. Who's correct? Shelby himself admits to a complete lack of introspection, so we can't turn to him for any clear answers. The other characters are similarly difficult to get a bead on: McPherson seems as tough as they come, yet reveals an almost innocently romantic side; Laura shifts from victim to suspect and back again (not to mention from death to life to near-death); Ann is alternately a pathetic, grasping older woman and a clear-eyed, hard-as-nails black widow. Then there's Waldo Lydecker. He misleads us right away by narrating the opening, even though he will be dead by the close (no winking acknowledgement, ala Sunset Boulevard or American Beauty, here - up to the last moment we don't know if murder, suicide, or prison are on his horizon). And there's the ambivalence in his personality - the brittle, witty worldliness one moment, the incredible emotional neediness the next. That duality is acknowledged, repeatedly, by Waldo himself - so his ultimate ambiguity is not so much in who he is, as in how we relate to him. That opening narration, never repeated, inclines us to see the film through his eyes but by the end he's clearly the villain, and we're supposed to root against him as he fumbles with that shotgun at the close. McPherson comes closest to being our protagonist (some have even proposed that halfway through we enter his dream and the rest of the film isn't "really" happening) yet we never quite forget who introduced us to the world of Laura, and never quite lose our loyalty to Waldo, similarly to Laura herself. I had seen Laura once before tonight's viewing, about four or five years ago. Oddly enough, given my obsession with movies, my memory for them is terrible (at least when it comes to plot). I recalled and relished the mood and overall impression of the film, but could not recall how it ended - so this viewing was often as ambiguous and uncertain as the last. Watching the first half, I enjoyed the rich settings, the moody music, the great characters, the sharp dialogue, and the compelling story, but also wondered if I wasn't making a mistake in choosing this as my #1 noir, if great as it was I wouldn't have more to write about with The Third Man or another selection. Then came that famous scene where Laura reveals herself once again, and I was reminded of why I had been so drawn to pick Laura in the first place. I don't really go with the second-half-as-dream theory in a literal sense (I think there is too much ambiguity and complexity retained for it to be McPherson's vision), but in a symbolic sense there's something right about it. Characters have the fluidity they have in dreams, changing meaning and even appearance (the corpse, once Laura, becomes a co-worker after the fact). And Laura herself, by reappearing, takes on far richer connotations than she could have as a lovingly regarded corpse or memory. Stephen Russell-Gebbett once wrote of Twin Peaks: Fire Walk With Me, a movie about another longed-after, mysterious, murdered Laura (no coincidence on David Lynch's part, I'm sure), that "we are looking through a one-way mirror at a world that is unreachable, that is blind and alone," adding, "I have never seen a film where the screen has felt so thin...[yet] still too thick to smash, too thick to allow us to intervene." I wrote of the same film, "And then we see her...Not a corpse. Not being impersonated...Not a dream vision...nor a photograph sitting on the household mantle. ... Movies have a unique and potent ability to break one of the surest laws of our existence. Time can be shattered, history unearthed, the past rediscovered." Ultimately this is what is so moving and powerful about the central conceit of Laura: the movie creates a world in which one of the characters, not just the viewer, can seemingly shatter time (remember that McPherson breaks a grandfather clock near the end of the film) and recover a lost past, a past moreover that he missed out on the first time around. There's something profoundly effective, and somehow essentially cinematic, about how the movie takes a myth and makes it flesh and blood. It's like a metaphor for the dual reality all films inhabit, between recorded reality and make-believe, and some of the film's most compelling moments occur as we watch Laura's expressions, and McPherson's reactions, and wonder if she can be trusted, what she's thinking, if the truth can live up to the imagination or even surpass it. Laura's menagerie of misfits, its alluring mystery, and its ultimate ambiguity all secure the film in its #1 spot for me, late in the game to be sure, but better late than never. I'm sure McPherson would agree. A clip from "Laura" was included at 2:45 in "Dreaming in Wartime," a chapter in my video series "32 Days of Movies." It contains a spoiler, but if you read this essay it's too late anyway. "In a way, Laura is a somewhat offbeat selection. Director Otto Preminger's classy touch brings forth cinematography and art direction a bit less hardboiled, more glossy and romantic than one might usually expect in a noir." Yes Joel I quite agree on this point and many others you make in this tremendous essay. I came upon Wonders in the Dark during the Noir countdown and I'm glad I did. I found many new films to see, and some others to revisit. I watched Night and the City for the first time following Maurizio's pick of it as #1. It is a grand film. Laura is pretty great too and I understand why you would pick it. I've also heard some others complain that it's not really much of a film noir at all, which I disagree with. If I've learned anything, noir doesn't pander. It insists on its own terms. You know it when you see it and I think Laura definitively qualifies. The Lydecker character is the type of character that makes the world of Noir tick- the obsessive, morally hypocritical and manipulative type that must have his way at all cost. Brilliant stuff. I also get what you mean about the ending. I always seem to forget exactly how it's going to end! Thanks Jon! I still haven't seen Night and the City, or a lot of the other films on Maurizio's list. I have a Netflix queue devoted to Wonders countdowns but I'm still on Allan's lists I always divert myself back to the "random" queue and let that one molder. Curses of a short attention span. I can see why many question Laura's noir pedigree; watching it last night I was surprised by the extent to which it lingers on the edge of something else - melodrama perhaps - but than noir was never a specific codified genre. Like you say, you know it when you see it. Anyway if it was noir enough for the Roca, it's noir enough for me. Though Laura wouldn't rank as my No. 1 film noir, it sure ranks among my favourites. The theme of an investigator getting obsessed by/falling in love with a presumably dead lady's photograph & supposed persona was as arresting as it was disturbing. And yes, your mention of the terrific Noir countdown reminded me of the great times I had in following it, in the same way that I'd enjoyed Dave Goodfella's earlier noir countdown. Great stuff Joel! Thanks Maurizio. I look forward to covering The Third Man soon too. I recently ripped the Karas music off the opening titles and have been listening to it again and again on my iPod. Speaking of noir idiosyncracies, that soundtrack surely is one but damn if it doesn't work. A very good review. MovieMan, of a film that is one of my favourite noirs too. It was the atmosphere that got me too, and the fact that the characters have more about them than in your common-or-garden film of the genre. Atmosphere, for me, often seems the most important part of a film; what is in the air. I was never convinced by McPherson's love for Laura but that's probably because it's hard to imagine such a thing happening. Nice of you to mention my review of Fire Walk With Me. Thanks. The painting of Laura is very much like Laura Palmer's high school photo (or maybe even like the bits and pieces of Rebecca left in Hitchcock's film. Great point, Stephen - the more I think about/watch/read about these two movies/TV shows, the more I realize they are connected. Lynch has talked about not really watching many movies, but clearly the ones he has watched left an impact! I agree that McPherson's initial falling in love doesn't have too much time to develop, but it works for me simply because Gene Tierney is so lovely in the flashbacks and portraits that we can see how it could happen, even if it's rather quick for him and his characters doesn't seem the type. It's a bit of a cheat, but works I think.